CAP Barbell Deluxe Utility Bench Review - 7 Adjustable Bench Angles! If you’re looking to buy your first bench, then the CAP Barbell Deluxe Utility Bench is a great place to start! It has a couple of key features which are ideal for anyone who has weight training in their exercise routine and sets it apart from some of its competitors on the market. Gym quality but at a great price! The cap deluxe weight bench also a very reasonably priced bench, with a ton of great features making it ideal for those of you on a tight budget. However there are a couple of drawbacks which I believe are important to consider, depending on your needs and fitness goals that will talk about in this review below. Let’s look at the features below to get started. 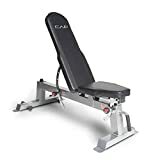 The CAP Barbell Deluxe Utility Bench offers a variety of positions – in fact there are seven different backrest positions and three seat-cushion positions, allowing you to complete a number upper, lower body and core exercises with appropriate back support. There’s no decline position on it – but unless you’re a serious bodybuilder most people are quite satisfied without the use of the decline position. In addition to using barbells and dumbbells with this bench, a unique feature is that it has anchor posts at the base of the frame – which allows you to attach resistance bands to add variety in your workout. This is a great feature for those who want a slightly more gentle, toning option, for people undergoing rehabilitation or the more senior users. Of course, any additional accessories such as the resistance bands themselves don’t come with this bench and will have to be purchased separately. What this really means is that you take the resistance bands and hook them under the bench hooks on the back leg. Then you can take the handles on each side and do bicep curls or bench press using resistance bands. Pretty sweet feature if you ask me. The main frame of the bench is made out of 12 and 14 gauge steel so it’s stable and durable. The steel is also powder coated – meaning it will protect it from rust and oxidation for years to come. The bench has oversize grip pop pins so you can alter and adjust the bench easily as needed. The back and seat cushions are covered in a decent leatherette material with a box stitch for extra support and comfort. However the padding on the backrest tapers in for the top half, so if you’ve got a broad chest and shoulders you might find this a bit annoying. The bench also comes with transport wheels and handles which make it easy to move it in and out of the right space. The CAP Barbell Deluxe Utility is a lightweight bench weighing just 42lbs so it’s easy to move around – yet it can still support a weight capacity of 500lbs in the flat position and 400 lbs in inclined positions. That’s a considerably higher capacity than some of the higher-priced benches on the market. The full dimensions are 53” in length, a width of 27” and 45” height when it’s in the upright position. This makes it quite a spacer saver so it’s ideal if you’re in an apartment or only have a small area for your home gym. It comes with clear instructions so you shouldn’t run into any difficulty trying to assemble; it may take around 30 minutes to put together so give yourself a bit of time. Unfortunately it only comes with a 30-day warranty which is much shorter than some of the other benches available in the market. Something that may be an issue for some users is that there appears to be a gap of several inches between the backrest and seat base in certain positions which could make lying down rather uncomfortable if your lower back is hanging between the two cushions. There is also no decline position. That won’t be a problem for most people but me personally it is because I do decline bench and I like to do ab work. So pick what is best for your workout routine. The CAP Barbell Deluxe Utility is a sturdy, solid weight bench which offers a variety of positions and features to add variety to your workout and keep your weight training program fresh – even without a decline position. You can find the best price here on amazon and you won’t be disappointed with the bench features and the price it comes with. If you or your partner use resistance bands then it’s ideal because of the anchor posts attached to it. It’s a great space saver and lightweight, but still has a high weight capacity and if you treat it kindly, it’s bound to look after you for years to come. I know this will not be the exact bench so check out my adjustable weight bench guide for more options if this bad boy is not tripping your trigger. ← PowerBlock Sport Bench – Is it Right For You?